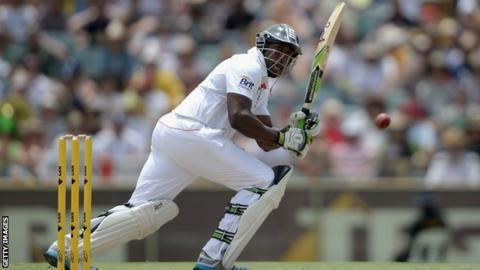 Michael Carberry has not given up hope of retaining his Test place, despite criticising the England management. The opening batsman played all five Ashes Tests in Australia but questioned the England coaches and selectors after being left out of the subsequent one-day series and World Twenty20. "In terms of where I stand with England, I've said what I've said and I stand by it," he told BBC Radio Solent. "The ball is in their court as to whether they want to pick me." Carberry, whose unbeaten century helped Hampshire to a County Championship win over Gloucestershire on Wednesday, was an ever-present in the Test side whitewashed 5-0 by Australia. The 33-year-old ended the series as England's third-highest run-scorer, with an average of just over 28. But, in an interview with the Guardian last month, he criticised the England management for not telling him why he did not play in either the one-day series or World Twenty20 that followed. "If I get a call-up, then I've always been proud to represent my country," said Carberry. "It's what gets me out of bed every day. But I don't make those decisions." However, he said his main focus right now was helping his county win promotion from Division Two. If Carberry is to keep his place in the Test side, he believes he will have to continue the form that saw him score an unbeaten century against Gloucestershire. "Everyone's path into the team is different," added the left-hander, who says he has been working hard on his game with Hampshire coach Dale Benkenstein. "I've had to churn out the runs, then churn out some more and then churn them out some more, so this is no different to any other year." Carberry reached his 100 with two sixes but very nearly missed out on a ton after James Vince came in and smashed 58 off 36 balls. With Hampshire needing just 12 to win, Carberry revealed the pair reached an agreement for Vince to slow down his scoring. "He's come in before and blasted it around and left me short, so it was very nice of him to let me get my ton," said Carberry, whose century at Bristol came off 131 balls. "He came down the wicket and said: 'If you want your ton, then I'll see it out and you can go for it.' I really appreciated it."